In applications like Microsoft Excel and Microsoft Access formatting dates and times is usually just a case of selecting an option from a list. 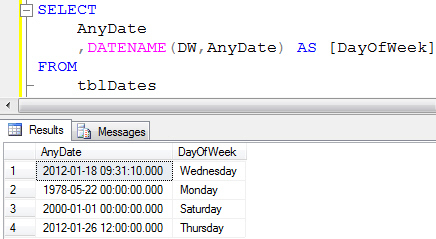 Unfortunately, in SQL Server you have to calculate a date format using functions! It's actually quite a simple function to use. A couple of simple tweaks and we get the century included in the year. There is a large number of date style codes that you can use with the CONVERT function. The table below uses the 26th of January, 2012 at 12:00PM as an example to show you what each code will return. The CONVERT function is great when you want to use one of the supported date formats, but if you want something a little more customised you have to work for it. 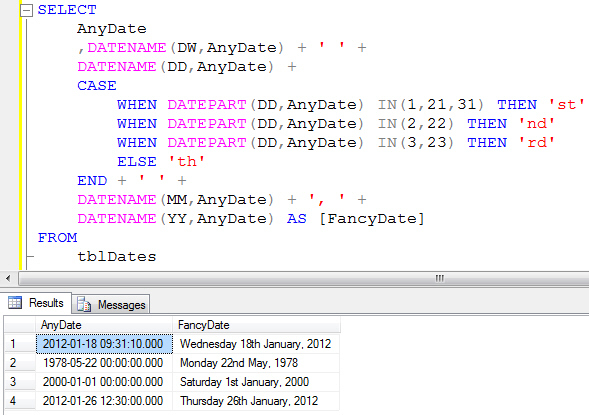 This type of elaborate date format is possible to achieve, but you have to calculate each part of it separately. The function is even easier to use than CONVERT. There are many codes that can be used with the DATENAME function. the table below lists what they are using the 26th of January, 2012 at 12:30PM as an example. We've also included information on the DATEPART function in the table. This function has exactly the same syntax as the DATENAME function; the only difference is that it returns numbers rather text. It's worth mentioning that you can't use DATENAME or DATEPART to get microseconds or nanoseconds in SQL Server 2005. The CASE statement is used to add the correct suffix to the day of the month. Now that we've seen how to make dates appear in any format we choose the only thing left to learn is how to perform calculations with dates. Read on to find out how!